Do your cases for the new Samsung Galaxy S6 and Galaxy S6 edge fit each other? No, the new Samsung Galaxy S6 edge features a curved screen that is a very different form factor from the Galaxy S6. Make sure you check the compatibility of your device when shopping for a case. 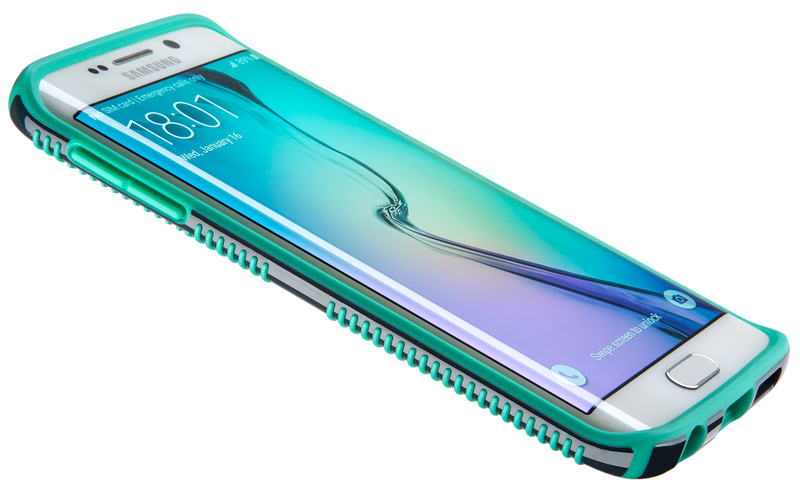 Do your cases impede the functionality of the side screen on the Galaxy S6 edge in any way? No, the entire screen of the Galaxy S6 edge, including the curved sides, is open and accessible. What benefit do Speck cases have for this unique design of a phone? The CandyShell Grip features a raised bezel (1.5mm) around the top corners of the screen of your Galaxy S6 edge, protecting the glass. When the phone is lying in a face-down position, the screen remains protected by this bezel and untouched from any surface. The raised rubber grips along the back of the CandyShell Grip also gives you a firm hold that allows you to get used to the new shape of the phone, plus an added sense of security while texting, taking pictures, and more. How did Speck design these cases to provide the best protection to the unique design of the Galaxy S6 edge? We applied our time-tested CandyShell Grip design principles to this device. We utilized 3D-printing to verify that our case would securely hold the phone while also making it comfortable to use its unique screen. Like all of our cases, CandyShell Grip for Samsung Galaxy S6 edge was designed to the military-grade protection standards that we test all of our existing CandyShell and MightyShell designs to. Will you have screen protectors for the new Galaxy S smartphones? Instead of offering standalone, replaceable screen protectors, we will be supporting the Galaxy S6 with our 2x shatter protective faceplate on CandyShell + Faceplate and MightyShell + Faceplate products. Will other screen protector brands be compatible with Speck cases? We do not recommend using another screen protector with our cases since we create a raised bezel that hugs your Galaxy’s screen to fulfill its military-grade protection requirement for drop testing. If you’re looking for the ultimate screen protection for your Galaxy S6, you should shop our CandyShell + Faceplate Galaxy S6 case and MightyShell + Faceplate Galaxy S6 case.